Anivara Asthanam is the accounting festival at the Tirumala Tirupati Balaji Temple. Anivara Asthanam marks the closure of old accounts and beginning of new accounts. It marks the beginning of new financial year at the Tirupati Venkateswara Temple. The name Anivara has been derived from the Tamil month of 'Aani' which generally correspondence to June - July month of Gregorian calendar. As this ritual is performed in Aani month, it has been referred to as Aanivara event. In Sanskrit, Asthana means the royal court. Thus, ‘Anivara Asthanam means the royal court (of Lord Venkateswara) held during Ani month. 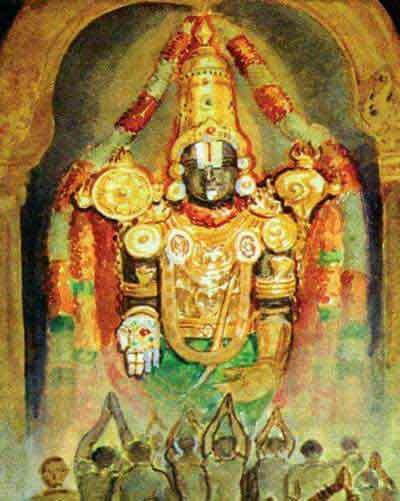 Sri Venkateswara Swami is the king of kings ruling all the three worlds. Since the King of the Universe has made Tirumala as His abode on earth from where He rules the worlds, special royal courts will be held on specific occasions during which the Supreme Godhead presides over the court and listens to the appeals made by the devotees. Venkateswara Swami conducts his royal darbar. Anivara Asthanam too is one such occasion of Lord Srivari conducting His royal court but it is unique in its performance. Anivara Asthanam marks the closure of old accounts and beginning of new accounts. At Tirumala, Srivari temple becomes the venue and TTD officials play the role of Finance Ministry while Lord Ventakeswara presides over the entire proceedings of closure and opening of account books. How is Anivara Asthanam Performed in Tirumala? This ritual begins at 7.00 AM on the specified day in Tamil Aani month, with the arrival of Sri Malayappa Swami, the processional deity of Tirumala temple, with His two consorts Sridevi and Bhudevi in golden palanquin. They take their royal seats at Bangaru Vakili (Golden Door) located inside the main temple. Sri Malayappa Swami and His consorts are bedecked with rare jeweler such as Makara Kanti to suit the grandiose of the royal court and sits in Sarva Bhupala Vahanam signifying His emperorship over all the lords of the world. Sri Vishwaksena, the military general of God Vishnu (senathipathi) accompanies Lord Balaji throughout the Asthanam ritual. Senathipathi sits on to the left side of Balaji and participates in the proceedings. Special rituals such as Visesha padi and offering silk clothes to the deities will be performed by the temple priests in accordance with Agama scriptures. The Jiyyangars of Tirumala and top executives of the TTDs such as the Executive Officer, JEOs and other officers participate in the Asthanam. All the officers pledge their loyalty and fealty to the Supreme Godhead by placing the official seals of their offices before the God. This occasion also serves as the submission of annual accounts of the previous year to the Supreme God and His permission is sought to open the new books of accounts. Thus the ‘Anivara Asthanam’ marks the beginning of new financial year as far as the Tirumala temple’s accounts are concerned. On this occasion in another significant event the administrative officers of the TTD that manages the temple take their oaths in the presence of God and Goddesses and dedicate themselves to serve the Lord in the new financial year with the same devotion and faithfulness with which they have served in the previous year. The Asthanam ritual is completed in two hours time after which Sri Malayappa Swami and His consorts go for witnessing other daily Sevas. In the evening, there will be a special procession conducted in the four Mada streets. A vehicle called “Pushpa Pallaki” made up with tons of flowers is used to carry the processional deities that makes its way through a sea of devotees thronging the Mada streets of the holy temple town. The annual closure and opening of books of accounts that takes place during Anivara Asthanam symbolizes the closure and opening of Karma (deeds) of the mortal beings. In the book of life of a human being, Punya (virtue) is considered as a credit and Paapa (vice) as a debit. Lord Yama and his assistant Chitragupta keep this invisible book of accounts of Punya and Paapa for every living being on a daily basis. But it is the responsibility of the Jeevi (living being) to submit its account of vice and virtue to the Supreme Godhead and seek His grace to maintain the book well in coming days. The submission of official seals of the top executives of the temple management team signifies the complete surrender to the God Almighty who is the ultimate ruler, benefactor and giver of comfort. By vouching their loyalty and fealty alone the living beings can redeem their virtues and atone the sins committed due to the ill effects of Kali Purusha. Thus the Anivara Asthanam epitomizes the need of having Bhakti, Prapatti and Sharanagati elements in one’s heart and deeds. Source - Saptagiri Magazine published by TTD July 2017 page 6 to 9.